This article is also available to download and can be freely distributed. Ever since the first international submarine cable, a copper-based telegraph cable, was laid across the Channel between the United Kingdom and France in 1850, the submarine telecommunications industry has been connecting countries and continents. From the first trans-oceanic telegraph cables in the late 1800's, to the telephony cables of the mid 20th century and finally to the fibre optic era that began in the late 1980's until now, submarine cables have enabled the world to communicate in milliseconds rather than weeks. This phrase over the years cemented itself into the minds of the public, so much so, that even now many people think that global communications are carried via satellite. However, as little as 3% of global communications are carried in this way, which means that 97% of the world's communications are transported around the world via fibre optic submarine cables. In other words telephone conversations, the Internet, emails and television are all reliant on cables. We now live in a world where, just about, everyone is connected daily to the Internet. The average person may well have two or more devices upon their person capable of accessing the web. Notebooks, tablets, smart phones? Note: A smart phone isn't smart if it cannot access the Internet. The next time you access Facebook and, perhaps, receive a status update from a friend on holiday in Singapore, read a tweet from a Hollywood star you're following, watch a film on Netflix, place a bet during a football game, listen to a music track on Spotify or iTunes, watch a breaking news story reporting from a location overseas, receive an email, text or just call somebody abroad, it is very likely that you have unknowingly used a submarine communications cable. As you can see without submarine communications cables the Internet and businesses such as Google and Facebook would not exist. The Internet/digital economy is wide ranging, growing at an enormous rate and is very difficult to measure accurately. 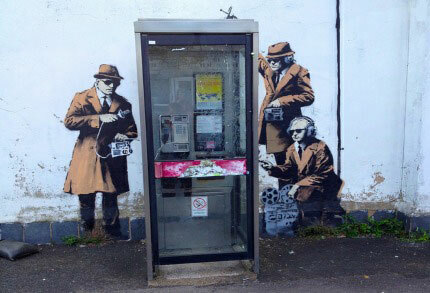 Frontier Economics reported in 2011 that revenues from the UK telecom industry amounted to £39.7 billion. Whereas, in 2012, Boston Consulting Group advised that the Internet contributes to 8.3% of the UK (and 5.3% to the EU) economy. A value of £121 billion to the UK, and could rise to £221 billion by 2016. It is forecast that by 2016 23% of all purchases in the UK will be done via the Internet. a 1 millisecond speed advantage over a submarine cable from New York to London can be worth £100 million a year to a major brokerage company. Potential advantages such as this are driving the build of new Trans-Atlantic Cables. As you can see Submarine Telecoms Cables are not just about Facebook and twitter. They are the foundations that the UK's future economy will be built upon. What is a Submarine Communications Cable? The common and consistent components of any Submarine Communications Cable are the fibre optics, strands of glass, not much thicker than your hair. Data can be transmitted along these strands via wavelengths of light, at the speed of light and over hundreds of kilometres without interference. Each of these fibre optic strands is capable of carrying vast amounts of information. The latest technology could potentially provide upwards of sixty 400Gb per second channels down just 1 no. 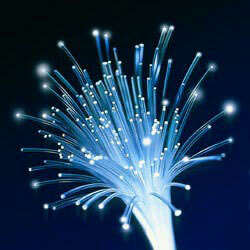 fibre optic strand. To try and quantify that, that is enough capacity to carry 375 million simultaneous telephone conversations on 1 no. fibre optic strand. The number of fibre optic strands in a cable varies, usually dependant on length, from around 4 - 8 for a Trans-Atlantic cable, but up to 200 for a cable across to Europe. Generally submarine cables are no larger than 60mm dia. 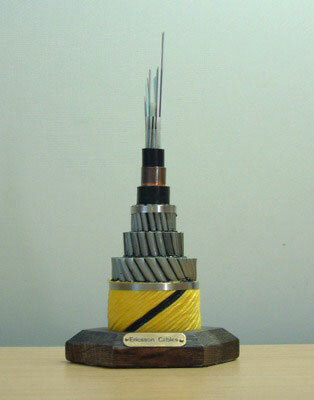 The remainder being made up of a polyethylene insulating/water proofing material, a copper core (needed to transmit power to signal boosting equipment), and potentially varying combination types of steel armour wires - depending on location and application of the cable on the sea floor. Cable Ship towing a plough on the sea bed. Where possible, and necessary, the preferred option is to bury the cables under the sea floor. This is usually on the continental shelf where it is shallow enough for the cable to be damaged by ship's anchors or commercial fishing. The plough is towed by a cable ship, like the one above, it lifts a furrow of the seabed and the cable, fed from the ship's hold, slides into this furrow, after the plough passes the part of the seabed that was lifted, it is returned back to the seabed on top of the cable. 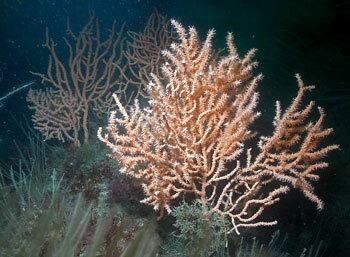 Burial depths vary according to seabed conditions. In some cases it may not be possible to bury a cable, for example where there is hard rock. In these situations other methods of protection may be considered, such as, increased armour to the cable construction, protective outer casings, covering with graded material or covering with modular protective units of polyurethane or concrete. In some cases it may be that there is no need to protect the cable and it may be laid directly on the sea floor, which is largely the case in deep oceans. Unfortunately Cables are damaged often. According to the Atlantic Cable Maintenance Agreement www.acmarepair.com there were 37 cable faults around the UK continental shelf during 2013. The good news is that you will not have noticed. Cable owners invariably have arrangements in place to use capacity on other cables. However should three or four be damaged, the Internet would most likely noticeably slow down. As a submarine cable hub the UK is very well placed to have cable diversity. There are many other cables that capacity can be switched to should a cable be damaged. Other countries around the globe are not so lucky. The overwhelming majority of these faults are caused by either commercial fishing trawlers or ship's anchors. In other parts of the world earthquakes and sub-sea landslides can also damage cables. One popular myth that can be dispelled is that shark bites are a common cause of damage. The International Cable Protection Committee recently advised that an analysis of 840 fibre-optic cable repairs for 2008-2013 recorded that no cable faults were attributable to shark interaction. To assist other sea users cable positions are charted and the information is freely available to appropriate parties. Cable owners try to combat the threat from fishing by using cable awareness projects such as www.kis-orca.eu where cable information is freely given to fishermen across Europe. Fishermen should not trawl over cables primarily for their own safety, to avoid snagging their nets and risk capsizing their vessels but it should be known it is against the law to wilfully damage a submarine cable. In regards to anchor damage, due to new technology, many damages that may have previously been attributed to fishing have now been identified as caused by ships anchors. This is because all large vessels now have to transmit their location via a system called AIS, and these can be viewed on websites such as www.marinetraffic.com. Cable owners can use this information to warn them if a ship is acting suspiciously around their cables, such as slowing down, or being stationary in close proximity to a cable. Cable positions are charted and the information is freely available to appropriate parties, so vessels can use their navigation systems to ensure they anchor and, or fish, at a safe distance from cables shown on KIS-ORCA charts. Therefore there is no legitimate excuse for damaging a submarine communications cable. When a cable is damaged, the sole focus is to repair it as quickly as possible. Cable owners have agreements with cable repair ship operators either on an individual basis or as part of a consortium. 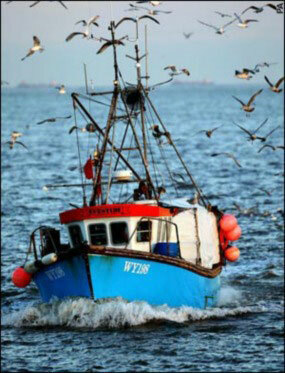 Many cable owners around UK waters are members of the Atlantic Maintenance Repair Agreement www.acmarepair.com. One or two repair ships are based in the UK and France depending on the time of year. Within 24hrs of a cable being damaged, a ship is dispatched to repair it. How badly a cable is damaged will influence how the damage is located. This can be done either by measuring the difference in the electrical resistance of the cables copper core, or by measuring how far a pulse of light travels down the fibre strands. Either method gives you a distance to the damage point, and as the cables are well charted the ship will usually arrive within close proximity of the damage location. Once on the repair location there are various other methods the ship can use to pinpoint the damage. In order to repair a cable it must be brought to the surface, and to enable this the cable must be in two pieces, so if the cable has not been severed during the damage the cable ship will cut it. Each end of the cable is brought to the surface and tested back to shore to ensure there is no other damage. The two ends cannot be re-jointed together as there is not enough slack, therefore a piece of stock cable on the ship is spliced into the original cable to connect the two original ends. Therefore, every time you repair a cable, you are making it a bit longer than when originally laid. If the cable was originally buried, then after repair, the cable needs to be reburied. 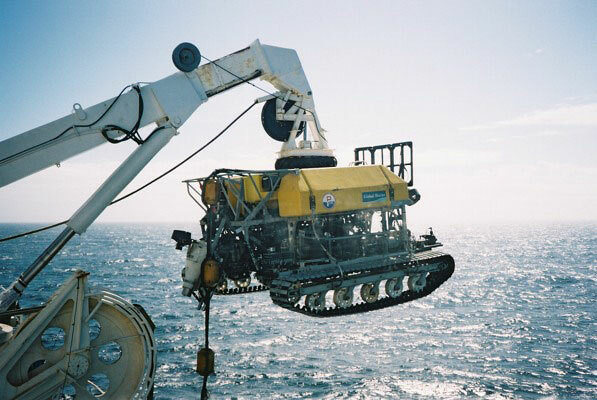 This is usually undertaken by a submersible called an ROV (Remotely Operated Vehicle). This re-buries the cable using a highly pressurised jet of water. a submarine cable extremely difficult, if not impossible, to do undetected and without damaging the cable/fibre. Such notions are firmly within the realms of fiction. If the security agencies in the world are indeed monitoring the Internet, they are accessing it somewhere other than the ocean floor. The marine environment is very important. As a responsible marine industry the subsea cables sector does all it can to have a minimal impact on the environment. As mentioned earlier submarine communications cables are small in diameter. 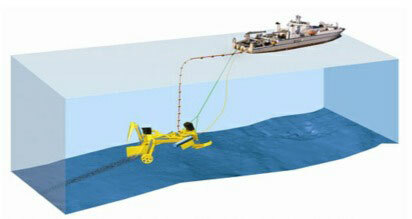 Any disturbance to the seabed is only undertaken during installation, or repair, and affects only a narrow section. At all other times the cable is benign to the environment. In England and the UK, cable installation and maintenance is recognised by the UK Government's conservation advisers, Natural England, and the Joint Nature Conservation Committee (JNCC), as having minimal affect on the environment and is an activity that is compatible to be undertaken within Marine Conservation Zones. In 2009 the International Cable Protection Committee (ICPC) and The United Nations Environment Programme World Conservation Monitoring Centre (UNEP-WCMC), published a comprehensive study of the impact of Submarine Cables on the marine environment. The publication can be downloaded as a PDF from the ICPC website and shows that there have been a number of studies to examine the environmental impacts of cables and cable laying, all of which suggest that the impacts are small or insignificant and only temporary as a result of cable laying. In other words, once a cable is in place its impact on the environment is harmless and will stay this way for the life of the cable, unless the cable is damaged by commercial fishing or ship's anchors. Submarine cables are at the heart of the way the modern world is developing; they are critical to global communication and they will be central to the future of established and developing global economies, and they can do all this without having an impact on the environment, something which is essential in creating a sustainable future for the ever busier world. The Executive Committee European Subsea Cables Association. European Subsea Cables Association is a forum of national and international companies which own, operate or service submarine cables in the UK and surrounding waters. The principal goal of European Subsea Cables Association is the promotion of marine safety and the safeguarding of submarine cables from man-made and natural hazards, serving as a vehicle for the exchange of technical and legal information pertaining to submarine systems without compromising the commercial and market aims of individual companies. Liaising with all relevant parties affected by the installation and operation of submarine cables landing in the United Kingdom or passing through United Kingdom waters. Funding of projects which are agreed to be beneficial for the protection of submarine cable systems. Participation in relevant industry expositions, meetings and technical conferences. Facilitating the design and production of promotional materials. When appropriate, appointing one or more of its members to represent European Subsea Cables Association interests at forums.